After two years of hardship, the DCU men’s tennis team have returned to the top of the Irish collegiate tennis hierarchy following their 5-4 win over defending intervarsity champions Trinity College recently. DCU began the event in superb form, defeating the TCD second team in the opening match 5-0. They carried their momentum into their semi-final match, silencing the UCC supporters with a dominant 5-0 win to book their place in the final. On the other side of the draw was an eagerly anticipated semi-final clash between TCD and UCD. Despite strong performances from Fergus O’Connell and Ben Dillon on the UCD team, the TCD players ran out clear winners in the end on a scoreline of 5-2. The final took place in the Westwood Leopardstown Tennis Club on Sunday March 2nd. The format of playing the three doubles matches first, followed by six singles matches, made for a very exciting finish to the event. Outstanding doubles performances from Roman Grogan, Lucas Hennessey, Craig O’Neill and Mick Lynch gave DCU a strong 2-1 lead going into the singles matches. The standout performances in the doubles matches carried over to the singles with wins for Lynch over Mark Carpenter 6-3, 6-4. Grogan, who has never lost an intervarsity match for DCU in his third year representing the college, also recorded a straight sets win over Tommie Murphy. TCD, however, were determined to defend their title and wins at the number one, five and six positions tied the final at 4-4. The deciding match was played out by DCU’s O’Neill and TCD’s Jack Devine. O’Neill took the first set 7-5 and had a chance to serve for the match at 5-4 in the second set. Devine fought back, however, winning the second set 7-5 to take the match into a deciding set. Devine started off strongly, breaking the DCU man’s serve in the opening game of the third set and O’Neill, who was suffering physically, looked down and out. As nerves set in, though, O’Neill, the more experienced player of the two, managed to grind his way back into the match. With a netted forehand from Devine at 4-5 match point down, O’Neill took the set 6-4 and secured a historic win for DCU tennis. “I am absolutely delighted for the players. 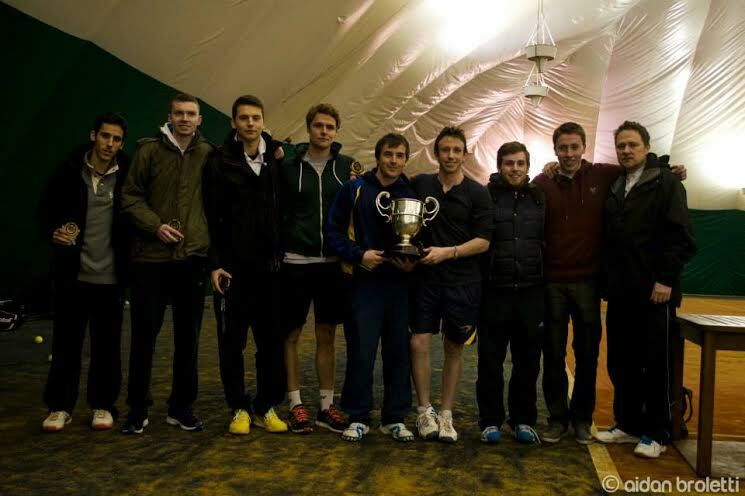 It is one of the closest intervarsity championships I can remember,” said DCU Tennis coach Jamie Pilkington. The DCU women’s team were not able to defend their final showing of last year and bowed out in the quarter-finals to a strong NUI Galway team. The women’s event was won by TCD, who managed to retain their intervarsity title with a comprehensive win over UCD in the final. The championships, which were hosted by DCU, involved over 150 players from eight universities and colleges.